Messages and ideas make a better impact when they are shaped in chocolate. Our chocolate pieces, measuring 3-6 sq. 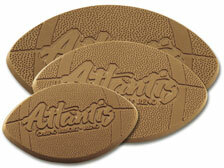 in, are shaped to represent your distinctive idea and make perfect business or recognition gifts. The customization is done at no additional cost. Elegant gift boxes are also offered at no extra charge.